Our research on Nitric Oxide first began with the discovery of its unique impact on cardiovascular health. Its immense importance as a biological signaling molecule resulted in the awarding of the Nobel Prize in 1998. Realizing that the discovery of Nitric Oxide had immense potential, it didn’t take long for our interest in N-O to become our passion. Dr. Nathan Bryan, our Chief Science Officer and co-founder, has committed his life’s work to the field of N-O research. By partnering with leading N-O discovery programs, such as the University of Texas Health Science Center, Dr. Bryan has identified and continues to identify ways to replenish the body’s N-O, and even help the body to promote optimal N-O function. Claims: Promotes healthy circulation and healthy blood pressure levels. This entry was posted in Food Trends, News, Newsletter, Product Review, Supplements and tagged black, cherry, circulation, HumanN, superbeets, Superfood, supplement on December 4, 2016 by Staff Editor. Carbonated, caffeine-free rooibos tea blended with Bhakti’s signature fresh-pressed ginger and organic tart cherry juice. Carbonated organic Fair Trade rooibos tea, organic tart cherry juice concentrate, organic cane sugar, organic ginger juice, organic black carrot extract, organic cherry flavor, citric acid, monk fruit extract*. *Monk fruit, also known as lo han guo, is a small round fruit grown in Southeast Asia. It has been safely used for centuries in Eastern medicine as a cold and digestive aid, and now it is also being used to sweeten foods and beverages. Monk fruit sweetener is created by removing the seeds and skin of the fruit, crushing the fruit, and collecting the juice. The fruit extract, or juice, is around 150-200 times sweeter than sugar and contains zero calories per serving – meaning a very small amount provides a lot of sweetness. Brook Eddy, founder of Bhakti traveled to India in 2002. She was fascinated with a social justice movement based on Bhakti (or devotion through social action) and wanted to learn more about it firsthand. On the journey she fell in love with two things that would ultimately become the foundation for her life’s work. The first love was this idea that no matter what your station in life, you have a responsibility to contribute to the community and doing so will have a pervasive and lasting impact. In the communities where she learned about Bhakti, families would invite her into their homes and share their experiences about how this social movement had impacted them and their communities over a cup homemade spicy chai. She couldn’t help but fall in love with its incredible flavor and aroma. When she returned home, she began brewing her own chai. Standing over the pot of steaming chai on her stove and inhaling the layers of fragrant spices, Brook was suddenly swept back into the chaos, colors and vibrancy of India and all that she had experienced there. When her homemade brew gained attention (and even addiction) from friends and neighbors, she decided to take the principles of Bhakti that she had learned in India and build a company on this ideal. This single mother of twins took a deep breath, quit her full time job, and dove into the process of bringing consumers a craft-brewed chai that was steeped in social and environmental change. Claims: Organic, non-GMO and caffeine-free. This entry was posted in Beverage, Drink Trends, Iced Tea, News, Newsletter, Product Review and tagged bhakti, cherry, fresh ginger, iced tea, rooibos, sparkling, us on August 17, 2016 by Staff Editor. Cherry Lime NOOMA is a twist on an old-time favorite. It has a fresh, crisp taste and is overflowing with rehydrating electrolytes. An after-sweat fix-me that will keep you feeling your best all day long. Our story started with one idea - the world needed a better hydration drink. Really crazy, we know. But that simple thought led us on a journey filled with launching projects, making mistakes, a lot of learning and taking big risks. We finally landed on a drink that we loved to put in our bodies after a sweat. And while we still can’t get enough of those electrolytes in our lives, we realized that the real magic of NOOMA is more than the liquid inside the package. It’s a part of something much bigger. Fueling something much more important. a passion for wellness. a lifestyle. It’s all about the people. The ones that think it’s fun to use the wind as resistance training on a run. Smile when they hear it’s burpee challenge day. Who live for that feeling you get lying on the floor after a workout, totally spent. They’re out there going for…whatever they’re going for. Claims: USDA organic, gluten-free and non-GMO. This entry was posted in Beverage, Drink Trends, News, Newsletter, Product Review, Sports Drinks and tagged cherry, electrolyte, lime, nooma, organic, sports drinks, us on June 7, 2016 by Staff Editor. With Real Fruit, electrolytes, vitamins, natural flavouring and natural sweetener. Intended for after sustained intense muscular activity. Add a rounded scoop (33g) or 4 heaped table spoons to 300ml of water in your Secret Training drinks bottle, and shake vigorously, ensuring the lid is firmly closed. For best results consume within 20 minutes of finishing hard exercise. per 100g/33g serving Energy 1574kj 364kcal/511kj 120kcal. Fat 0.3g/0.1g, of which saturates 0.2g/0.1g. Carbohydrate 30g/9.8g, of which sugars 10g/3.3g. Fibre 2.1g/0.7g. Protein 61g/20g. Salt 1.5g/0.5g. Per 100g/33g RDA: Electrolytes (Calcium: 760mg/251mg (31%), Phosphorus: 135mg/45mg (6%), Magnesium: 201mg/66mg (18%), Zinc: 6.2mg/2.0mg (20%), Potassium: 417mg/138mg (7%)). Vitamins: B3: 36mg/11.8mg (74%), B5: 13.6mg/4.5mg (75%), B2: 3.2mg/1.1mg (75%), B6: 3.2mg/1.1mg (75%). PROTEIN Blend (Whey Protein Isolate (from Milk)(62%), L-Leucine), Whole pitted cherry powder (5%), Maltodextrin (from maize), Fructose, Electrolyte mix (Calcium Lactate, Magnesium Citrate, Sodium Chloride, Zinc citrate), Sticky Rice Starch, Stabilisers (Gum Arabic, Xanthan gum, Lecithin (From Soya)), Natural Flavouring, Acidity regulators (Citric acid, sodium citrate), Elderberry extract, Natural Sweetener (Stevia), Vitamins (B3, B5, B2, B6). Claims: Contains real fruits, electrolytes and vitamins. This entry was posted in Beverage, Drink Trends, Energy, News, Newsletter, Product Review and tagged cherry, energy, Secret Training, Stealth, uk, whey protein on April 27, 2016 by Staff Editor. A UNIQUE FRUIT COMBINATION OF APPLES, CHERRIES AND ELDERBERRIES – THIS DELICIOUS, FINELY BALANCED DRINK IS THE JEWEL IN CROWN. 23% FRUIT JUICE CONTENT. Claims: High fruit content, only natural flavors, vegan. This entry was posted in Beverage, Drink Trends, News, Newsletter, Product Review, Soft Drinks and tagged 2016, apple, cherry, drink trends 2016, elderberry, Fritz Kola, germany, limo, soft drinks on March 29, 2016 by Staff Editor. Instinctively, we all know what's good for us. But sometimes, within our busy lives, we need to be reminded that it's important to take time and enjoy those good things, even if just a little. Made with real fruit, dark chocolate and whole nuts in bite-size portions, goodnessknows® snack squares is one of those little things. With 150 calories, no artificial colors, flavors or sweeteners, goodnessknows® snack squares is a perfect satisfying snack. Almonds, dried peaches(peaches, sugar,critic acid), crisp rice (rice flour, rice bran, raisin juice concentrate, honey, salt), toasted oats (oats, brown sugar, sugar), brown rice syrup, dried cherries (cherries, suger), chocolate, suger, dried cane syrup, cocoa powder, almond butter (almonds), canola oil, glycerin,cocoa powder, almond butter (almonds), canola oil, glycerin, cocoa butter, milkfat, sea salt, soy lecithin, critic acid, natural flavours, mixed tocopherols to maintain freshness, almond oil, peanut oil. Contains almonds, peanuts, milk and soy. May contain other tree nuts. wheat and egg. In 2010, goodnessknows® snack squares was launched in the Boulder and Denver, CO area through an extensive in- store sampling program bringing the wholesome goodness taste to the mountain region. Consumers loved the delicious product so goodnessknows® snack squares launched a full-blown grassroots tour which consisted of partnering with Denver's B-Cycle program for Bike to Work Day and raising money for The Bike Depot for every mile biked by local residents. In four short years, goodnessknows® snack squares expanded to Seattle, Portland, and Dallas and began to spread the goodness within the community. With their signature events at Larimer Square in Denver, Washington Square in Portland, and Pioneer Square in Seattle. Local residents were able to share the goodness in their lives, participate in fit activities, and raise money for city food banks. Claims: Contains almonds, peanuts, milk and soy. Hand-selected cocoa beans. This entry was posted in Bars, Food Trends, News, Newsletter, Product Review and tagged almond, bars, cherry, dark chocolate, goodness knows, peach, us on February 9, 2016 by Staff Editor. Our latest Cellar 3 release is now arriving at select bottle shops nationwide. This refined evolution of our Belgian-style Saison is foudre-fermented with Brettanomyces, then aged and re-fermented in red wine barrels with sweet, dark cherry puree. After 6 months, a crimson ale with champagne effervescence is released, offering notes of ripe stone fruit and barrel-drawn tannins. Retaining hints of earthy wild yeast, Natura Morta Cherry finishes like a fine Beaujolais. Learn more about Natura Morta Cherry and find this highly coveted rare beer at a location near you. Discover Cellar 3, where Green Flash brewers express their artistic genius and craft evolves into artistry. Each beer in the series is a masterpiece to be shared, celebrated, and savored. Elevate your craft beer experience with our limited reserve collection. Cellar 3 is 12,000 square feet of space dedicated to the art of craft beer innovation through barrel-aging and wild yeast experimentation with over 2,500 of the space reserved for the customer experience in the tasting room. Enjoy up to 30 unique Green Flash and Cellar 3 beers on draft. Visit our rotating art gallery, take a tour of the facility, fill a growler to go, or grab a bite from the rotating on-site food truck. Our Brewmaster, Erik Jensen, and his talented brewing team have developed an award-winning assortment of specialty craft ales that are uniquely Green Flash. After releasing the game changing West Coast IPA, our beers developed a loyal following of craft beer lovers. We remain steadfast in our commitment to a beer first philosophy. For that, we are celebrated by beer enthusiasts worldwide. To keep our fans thirsty for more, we consistently produce experimental, limited-edition and seasonal offerings in addition to a solid lineup of long-time favorites. Through our trailblazing approach to craft brewing, we have established a benchmark within the craft beer community. Our award-winning beers are on draft, bottled and are available throughout the U.S.A in bars, restaurants and retail outlets. This entry was posted in Beer, Beverage, Drink Trends, News, Newsletter, Product Review and tagged Cellar 3, cherry, green flash brewing on February 2, 2016 by Frank. What the chia? Those chia seeds are there for Omega-3s, fiber, calcium, iron and some super-powered pep for when daily crunch time comes around. This entry was posted in Beverage, Drink Trends, News, Newsletter, Product Review, Smoothie and tagged cherry, chia, naked, smoothie on January 27, 2016 by Frank. Beet juice is full of powerful antioxidants and nitrates, boosting stamina and endurance (the secret of high performance athletes! ), and our unique filtration allows for a desirably smooth taste! Both flavors of our juices are 100% natural, gluten-free, with no added sugars, artificial colors or preservatives. Ingredients: 50% Beet Juice, 34% Apple Juice, 10% Cherry Puree, 5% Blackcurrant Juice, 1% Lemon Juice Concentrate (as natural stabilizer). Love Beets is a true labor of love from husband and wife team, Guy and Katherine Shropshire. The Shropshire family, known for growing salad vegetables in England, decided to purchase a small beet factory with the hopes of sharing a family favorite with others. They knew they wanted to find a way to attract younger people to beets, so the family got to work experimenting with unique marinated beet recipes. Claims: 100% natural, gluten free, no added sugar. This entry was posted in Beverage, Drink Trends, Juice, News, Newsletter, Product Review and tagged berry & beet, cherry, gluten free, juice, love beets, us on January 10, 2016 by Staff Editor. With its splash of kirsch liqueur, this is the real cherry on the top! Chunky morello cherries enveloping our thick ‘n’ creamy yoghurt, Neil Diamond called it when he wrote ‘oh cherry cherry, she got the way to groove me all right’… no bull! 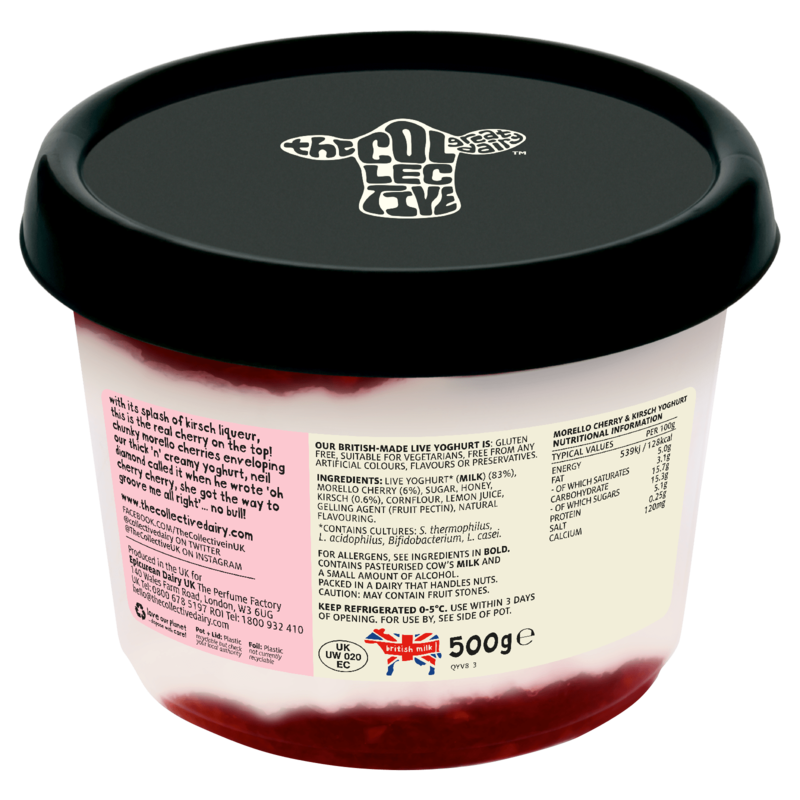 Ingredients: Live yoghurt* (milk) (83%), Morello cherry (6%), sugar, honey, Kirsch (0.6%), cornflour, lemon juice, gelling agent (fruit pectin), natural flavouring. *Contains cultures: S. thermophilus, L. acidophilus, Bifidobacterium, L. casei. 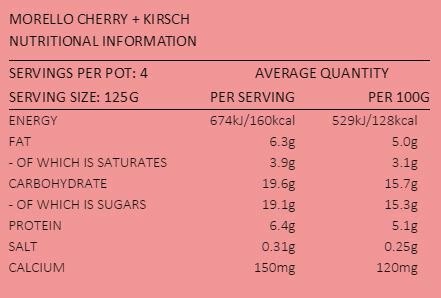 Our morello cherry + kirsch yoghurt contains pasteurised cow’s milk and a small amount of alcohol. It is packed in a dairy that handles nuts. The Collective was started in New Zealand by two clever entrepreneurial chefs, Ofer Shenhav and Angus Allan. Their quest was simple… create an extraordinary yoghurt with an unbeatable taste. Kiwis caught on fast and the resulting yoghurt rapidly found new homes across the land. In fact, within 10 months of its conception The Collective was New Zealand’s best selling gourmet yoghurt. Overnight sensation? You betcha! Now not being ones to keep a good thing to themselves, it soon dawned on Ofer and Angus that actually the whole world deserved The Collective in their fridges so why not make it in the UK too. Really, just how hard could it be? As it turned out darn hard! Until they joined forces with Mike Hodgson and Amelia Harvey, a couple of savy ‘Brits’ who knew a thing or two about the food industry in the UK. Claims: Gluten free, suitable for vegetarians, no artificial colors flavors, or preservatives. This entry was posted in Food Trends, News, Newsletter, Product Review, Yogurt and tagged cherry, kirsch, morello, the collective dairy, uk, yogurt on December 22, 2015 by Staff Editor.